Approximately 17,000 Gazan protesters are concentrated in 5 locations near the Gaza-Israel border. Approximately 17,000 Gazans are protesting in five locations along the Gaza-Israel border fence. The protest is part of the planned "march of return," and participants are burning tires, and throwing firebombs and stones at the border and at IDF forces. Meanwhile, the IDF is using riot control methods to disperse the crowds, and shooting at the main inciters. This week, the IDF prepared for the Gaza march, sending reinforcements, including snipers, and clarifying the IDF Rules of Engagement in cases where decisions must be made about opening fire. "We will not allow any harm to Israel's sovereignty or the security infrastructure at the border. IDF forces are prepared and at the site," an IDF spokesman said. 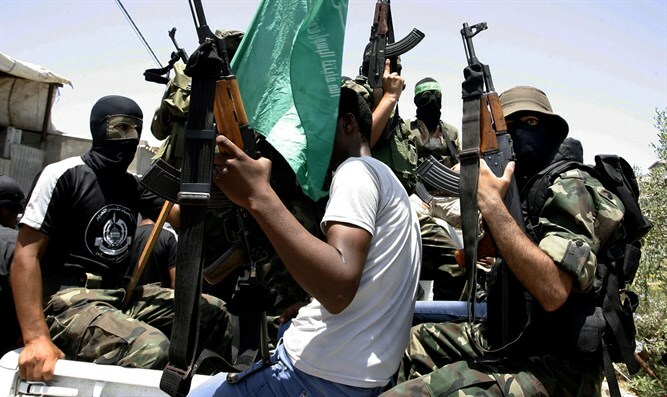 "The Hamas terror organization is endangering Gaza residents, and turning them into part of their terror activities. The Hamas terror organization bears full responsibility for all events and the consequences thereof." Earlier on Friday, IDF forces stationed near the Gaza-Israel border fired shots to deter Gazans from nearing the border fence.